How was your weekend? Mine was a pure bliss!! The night ended at private after party with friends and we had SO much fun! a great night out like that one. This outfit has everything I love in one. 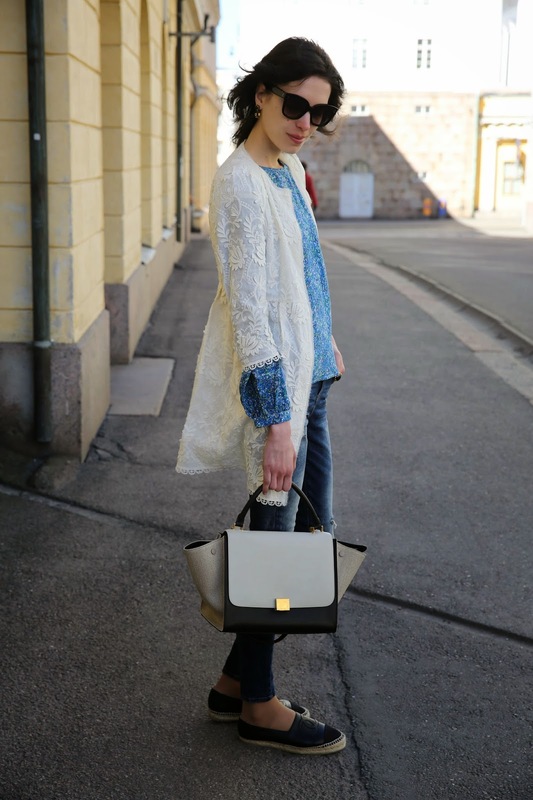 The lace jacket looks so ornate and beautiful! Congratulations on a successful exhibition! sviđa mi se jako kombinacija bijele i plave:) i divna torba. Drago mi je što je sve sjajno prošlo! Stunning outfit! Love the bag! Lovely outfit and the bag is divine. I'm so glad your exhibition went well, I knew it would and I'm looking forward to seeing the photos. I love the lace throwover and the top so much! I would love it if we stay in touch via bloglovin and gfc? Let me know lovely! I adore this post Dear! OMG Your celine tote!! Natali you are mega chic!!! Still so obessed with how you style your looks babe, such an icon! Speaking of designer bags *cheeky eyes*, I just bought the CHANEL GRAFFITI BOY BAG from the S/S14 RUNWAY SHOW, it's my newest favorite statement bag, please tell me what you think of it! Love this outfit. Cute shoes. beautiful!! love love love the bag !! !